Sharp knee pain when squatting can really put a damper on your workouts. Here’s what might be causing it and how to fix it. Squatting is a fundamental movement pattern. 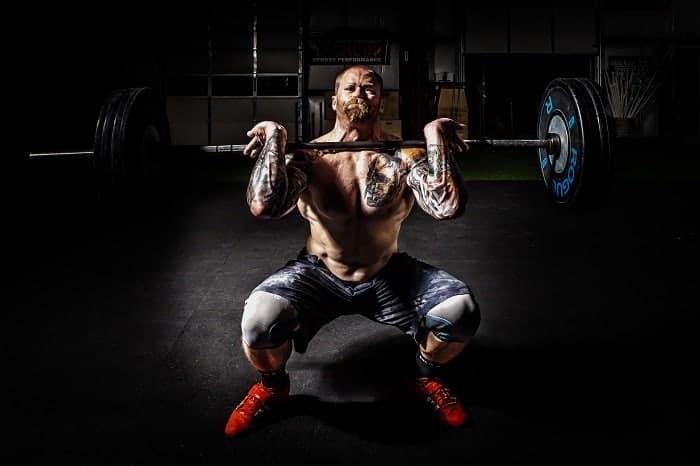 Not only are squats a good exercise in and of themselves, they are the foundation for powerful progressions like weighted squats, pistol squats, Olympic lifts and more. Squats are common in everything from weight lifting and cross fit to yoga and ballet barre. So if sharp knee pain when squatting is causing you trouble, you might be limited from a wide range of recreational and daily life activities. Paying attention to where exactly your pain is located can help clue you into the potential causes behind it. And if you know the source of the problem, you will be better equipped to handle it. There are 5 common reasons for sharp knee pain when squatting. We’ll take at each of these hidden causes PLUS what you can do to ease the pain. Problems with the meniscus in your knee joint are a common cause of knee pain from squatting. In fact, I’ve experienced this type of knee pain squats. This pain is usually caused by small tears in the meniscus, a disc of cartilage that sits between your femur and tibia (your shin bone) and absorbs shock and pressure in the knee . A major meniscus tear can be a serious problem that requires surgery, but a minor or microtear can simply cause pain and irritation during certain movements – like say, during squats. The pain is typically felt on the medial side of your knee, and often it feels like your knee joint suddenly locks or catches with pain as you squat. I have a slight meniscus tear and find the pain comes and goes randomly. I find my knee will just “click” into place and then I won’t have any problems for months until something “clicks” back out of place. One exercise that helps keep meniscus issues from causing me pain and interrupting my squats are SB Leg Curls. This technique will help provide stability to the knee by strengthening the hamstrings as they flex at the knee and extend at the hip. You’ll feel stronger and more stable at the knee joint by incorporating this move into your routine, especially since the hamstrings are often weak relative to the quads. Another common cause behind knee pain squats is a condition called chondromalacia patellae. This issue, which is sometimes called “runner’s knee” is very common among young, active people . 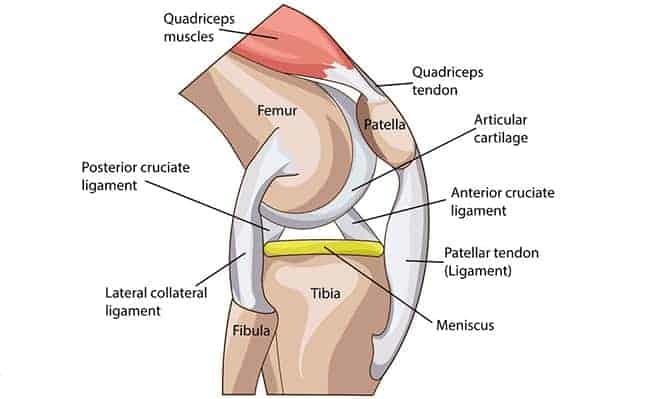 The condition is basically a wearing down of the cartilage that sits between the underside of your patella (kneecap) and the top of your femur. The pain from this condition is generally centered around on the front of the knee, on the kneecap. More specifically, it may be felt behind or below the kneecaps, or perhaps on either side of the patellae . The pain tends to get worse when you flex your knee, like when you pop down into a squat. You might even feel a grinding sensation in the knee when it’s bent in this way. Chondromalacia patellae is typically caused by some sort of biomechanical or muscular imbalance that is causing increased wear and tear on this cartilage. To help ease the pain and address the issue, you can’t just focus on the kneecap, you’ve got to look at how the knee functions with the other joints along the kinectic chain – you’ve got to think big picture. For example, try the Midline Muscle Activation Drill – a comprehensive balance technique that hits the hips, ankles, and knees all in one go. This 3-part move will help engage your joints while encouraging proper muscular activation and support. Patellar tendonitis is yet another common cause of painful knees when squatting. This issue affects your patellar tendon, which runs from your kneecap to your tibia. When this tendon becomes irritated or injured (usually from too much stress or pressure on the tendon), it can cause pain at the front of your knee. Patellar tendonitis is often called “Jumper’s Knee” because the tendon absorbs a lot of the force on your lower limb as you land and jump . But it could easily be called squatter’s knee as well, because performing this move also relies on the tendon. We’ve written another article focused on patellar tendonitis, so if this is your issue, you can read it here. This next reason your knees could be causing pain when you squat is pretty easy to spot. Take a look in the mirror as you squat. Are your knees staying more or less pointed straight forward? OR, are they starting to point in towards each other? If the second situation is the case, valgus knees could be the cause of your pain. This improper positioning (also called knock-knees) can be caused by a variety of issues, including weak gluteus medius muscles and internally rotated hips. Having a knock-kneed form could set you up for something a lot more serious than some pain with squats. Valgus knees can make you more prone to serious issues like ACL or PCL tears . Issues with hip flexion mobility and technique can also lead to knee pain in squats. This is the other type of squat knee pain I’ve experienced. This pain happens to me when I jump into working sets of squats without a sufficient warm-up, especially after a long time spent immobile and sitting. I don’t want to sound like a broken record, but there is no getting around it – the knee doesn’t operate in isolation. If your hips are either chronically tight or temporarily tight due to an insufficient warmup and you tell your body to assume a squat position, requiring deep flexion at both the hip and knee, your body is going to fudge it and make up for that hip tightness elsewhere. One place your body will look is your spine – your lumbar spine will flex and this could lead to injuring a disc or ligament and low back pain. This often leads to overactive quadriceps that step in to make up for underactive glutes and hamstrings. An overactivity of the quadriceps along the front of your leg puts excess stress on your patella and your patellar tendon. And that spells – you guessed it – knee pain. To avoid this type of knee pain, you’ll want to spend some time devoted to improving your hip mobility and encouraging proper activation of the muscles that work your hips. This article has a ton of great hip mobility moves that you can do while sitting! There’s no excuse for not incorporating these moves – try them at your desk or even while chilling out and watching TV. Your hips and knees will be much better for it. So take a little bit of time to consider which of these 5 reasons might be behind your knee pain when squatting. Start to incorporate exercises to address these reasons and improve your muscular balance and form. You should start to see reduced squat pain, meaning you can workout the way you want to and start to progress those squats.